These are all the words that came to mind when I saw the video of Andrew Johnson, the wrestler from Buena High School in Atlantic County, New Jersey who was told by a referee with a history of racist behavior he had to cut his dreadlocks or forfeit his match during a meet Thursday night. By now social media has exploded with videoes of the act of Johnson’s hair being cut and shuddered at the thought that in 2018, people like Alan Maloney, are in positions of authority around over our children. But as a veteran teacher and administrator, I know that there are scores of students like Johnson who are subjected to inhumane treatment at the hands of educators/schools who are supposed to be their advocates. Just like in any tale of the injustice of any student, it’s important for us all to agree on some pivotal points in this incident starting with the rule that Maloney used to justify the inhumane treatment of a child. Wrestlers are allowed to wear legal hair covers during matches, according to wrestling rules set by the National Federation of State High School Associations. If a wrestler’s hair in its natural state extends below the earlobe on the sides or touches the top of a normal shirt, it’s required to be secured in a hair cover. It’s common for wrestlers with long hair to compete with a wrap over their heads. According to Mike Frankel, the wrestler’s coaches argued the referee’s decision for several minutes, until the referee in question, Alan Maloney, started the injury time clock. At this point, Johnson had no choice but to remove the cap and agreed to have his hair cut. The New Jersey State Athletic Association asked that Maloney be sidelined until further notice and the New Jersey Division on Civil Rights has opened an investigation. Johnson had previously wrestled twice this season without incident and he did not wear a hair cover and there were no issues. And throughout all of these points, the one thing that’s lost is that now we still have a student, who was dehumanized and embarrassed in front of gymnasium full of people by an adult who should not have been allowed the opportunity to work with students after he uttered a racial slur in a room full of people in 2016. In a society where anti-racism is at the core of what we do, the New Jersey State Atheltic Association (or powers that be) should have excused Mahoney of his duties and protected every single student-athlete that he would have come into contact with. Instead, after lengthy hearings, the responsibility was put back into the hands of the schools to deny him the ability to referee their wrestling events. Not two years later we’re seeing the consequences all over social media after he was allowed to destroy a child in a gym full of people over their hair. I believe the only reason that the “higher ups” are even opening an investigation is that social media did its job and exposed the ugliness that can happen to students of color when we aren’t honest about who we have around our most valuable asset- our children. Instead, Andrew Johnson was a child who was forced to make an adult decision- cut his locs- in front of a gym full of adults and instead of the entire team walking off in solidarity, Johnson was lauded as a “team player” however in reality instead his hair was a sacrifice to satisfy the ego of adults who look to put students of color in their place. Johnson knew this and so did Johnson’s coach by the looks on his face. During the humiliating practice of having his hair cut like an animal in a barn, you can tell that Johnson’s soul was crushed, but he’s doing what society is telling him is mandatory- sacrifice himself to make others feel comfortable. 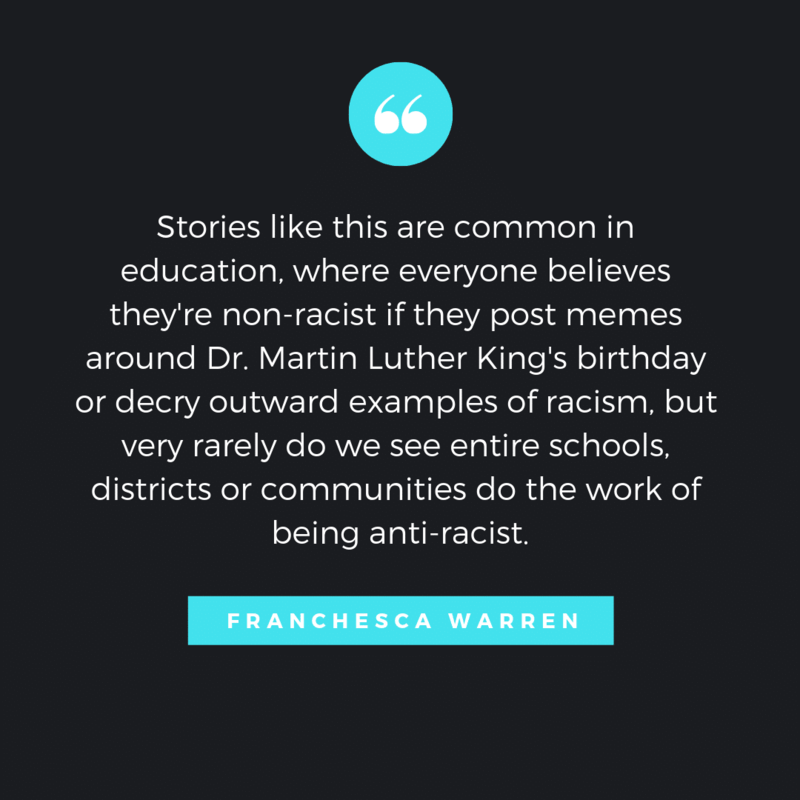 Stories like this are common in education, where everyone believes they’re non-racist if they post memes around Dr. Martin Luther King’s birthday or decry outward examples of racism, but very rarely do we see entire schools, districts or communities do the work of being anti-racist. Instead, we’ve seen students being slammed to the ground over cellphones, body slammed by school cops, racial slurs being yelled by classmates with no consequences and entire parties of students throwing up Nazi hand gestures and what do we do? Look the other way and still claim that it’s not everyone and that schools/communities are doing the best they can. You see that stance is easier than communities admitting that despite it being 2018, America is currently fighting for the soul of the country similar to what freedom fighters during the Civil Rights movement and many of these fights can be seen in our classrooms. -mandating mandatory anti-racism training for teachers, students, and community stakeholders. This isn’t negotiable and must be based in truth-telling and accountability. There are so many microaggressions that occur daily to students and teachers that go unspoken. – examining policies that entrap students like Andrew Johnson and force them to make adult decisions when they’re children. These policies include (but aren’t limited to) zero tolerance mandates around cell phone usage, hairstyles, and behavior that allow our students to be victimized all in the name of an “orderly school environment”. – hiring and supporting educators who bravely decide to advocate for their students. There are so many teachers who attempt to be the voice to the voiceless but instead, are scapegoated and punished because they do not “fall in line”. It’s common practice for there to be staff in schools where the faculty and staff know they spew hate but they are protected due to the archaic system of protecting people who have no business in schools. I contend that the referee should be permanently sidelined from ever working with students, but even more important, I believe that we must recognize that there are students like Andrew Johnson who are victims of unfair policies in schools- public and charter- across the United States. That’s the real work that has to take place and that’s the work that we know that must be done so that I won’t have to stories like this where our students are humiliated in the very space they’re supposed to be protected- schools.